CD80® Power Modules & Connectors. Convert your dimmer circuits to switched power circuits on the fly. Plug & Play CD80® Power Modules. 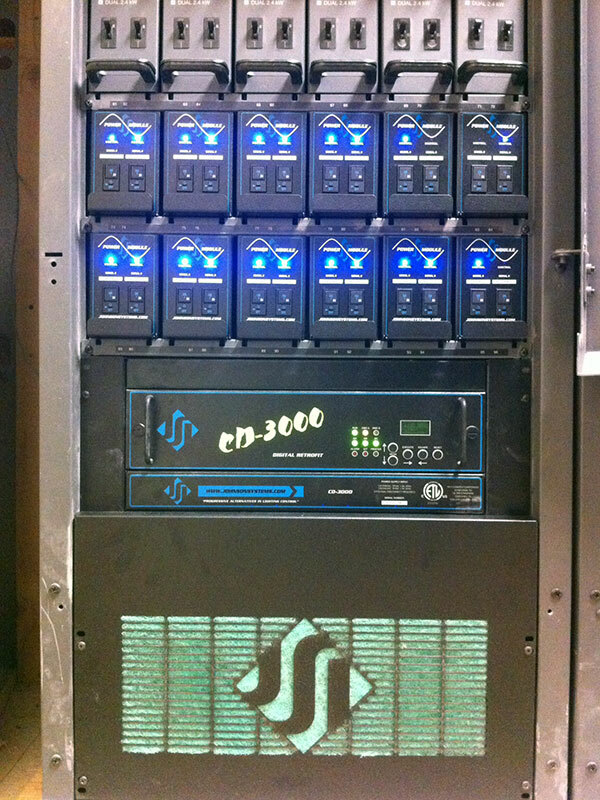 installed in CD80 Supervisor rack c/w CD-3000-SV control system upgrade. 3D PDF files are not supported by web browsers and require downloading and Adobat Acrobat for viewing. DMX Non-Dim relay control of devices/loads requiring pure sinusoidal AC Power. Designed for use with Johnson Systems CD-3000 and CD-2000 Control Systems. Available in both SV (Supervisor) and pre-SV models for every CD80® application. 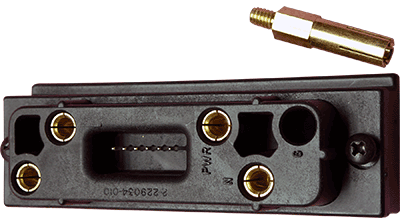 All models feature dual 20 Amp magnetic breakers with a UL 489 rating. 277VAC rated 50 Amp tungsten "air-gap" relays. Blue control LED indication of relay activation/closure. Dual 20 Amp constant power modules also available. Up to 10 year warranty available! CD80PM-AE Dual 20 Amp Non-Dim Relay Power Module for early generation CD80® and CD80® Advanced Electronics (AE). CD80CM-AE Dual 20 Amp Constant Power Module for early generation CD80® and CD80® Advanced Electronics (AE). CD80FM-AE Filler Module for early generation CD80® and CD80® Advanced Electronics (AE). CD80PM-SV Dual 20 Amp Non-Dim Relay Power Module for CD80® Supervisor (SV). CD80CM-SV Dual 20 Amp Constant Power Module for CD80® Supervisor (SV). CD80FM-SV Filler Module for CD80® Supervisor (SV). DE90PM Dual 20 Amp Non-Dim Relay Power Module for Environ 2 or Digital Environ. 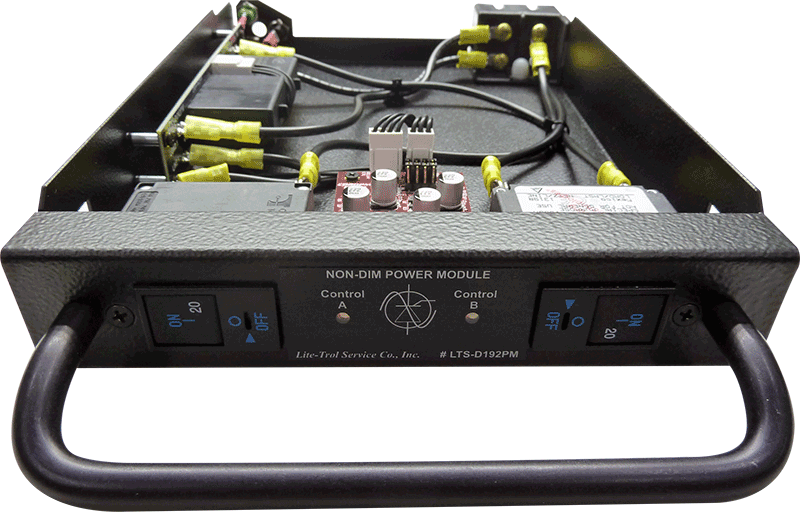 DE90CM Dual 20 Amp Constant Power Module for Environ 2 or Digital Environ. LTS-D192PM Dual 20 Amp Non-Dim Power Module for Colortran Dimension 192. 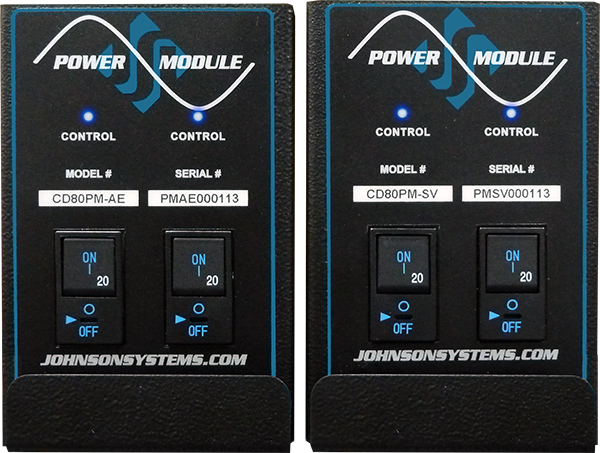 A two (2) year warranty applies to CD80 Power Modules if controlled by Johnson Systems CD-3000 or CD-2000 control systems. No warranty or product return is available if these products are used, even temporarily, with any OEM controls as they are incompatible. The inferior drive signals in certain controls may damage this equipment. shall be eligible for optional extended warranty up to ten (10) years!